I was wanting a sound card interface that was small enough I could throw in my bag and take with me while being modular enough to work with all my radios. Below I will give some details and show you how I accomplished this. This is actually the second Easy Digi kit I've assembled. The first didn't look quite so nice since I just used random junk I had laying around to make all my radio and PC connections. This time I planned out the process a little better. The kit is easy to assemble and I wrote about the basic kit that cost me around $12 here. Once the board is assembled, I wanted to have the smallest enclosure I could find to fit it. Playing around on aliexpress.com one day, I found the perfect enclosure for the project. Here's a link. It's a Waterproof case that measures 2.56"x2.28"x1.38". Now it wasn't a perfect fit as the threaded posts the top screws down to get in the way slightly. I did find that the Easy Digi board has two "ears" on the corners for screwing the board down. These ears can be removed and the assembled board slides perfectly into the enclosure. On three sides of the enclosure, I cutout a small notch to allow cables to feed into it. I also use small zip ties around the cables on the inside of the enclosure to help keep the cables from being pulled out. Next was time to make the PC audio connections. I have a lot of Cat5 cable laying around, so I decided to simply use some of this to fabricate my TO and FROM PC audio connections. The wire was solid core which is easy to solder to the board, but does not bend quite as easily as I would have liked. If the wires eventually break, I will replace the solid core Cat5 with stranded wire. If you don't have a spool of Cat5 type cable laying around, you can always look for a network cable and hack it. You only need to solder the Orange and Green connections to the "AUDIO to PC" on the board and the Brown and Blue connections to the "AUDIO FROM PC." You could skip using the Ring connection all together. To connect to the audio jacks, I knew I would need some 3.5 mm audio plugs. While I was making my order from aliexpress, I went ahead and found some of those too. Here's a link to those. I will say that these audio plugs are made very cheap, but they worked well for this project. Once the PC connection is made, it was time to figure out how to make the radio audio connections. I wanted it modular so I can use the same interface with multiple radios. I decided to use an RJ-45 jack. That way, I can make cables for any radio by simply changing the pin-out to what I needed. Again, I found an RJ-45 jack with short cable at aliexpress. Here's the link. Not sure what the actual purpose of this cable was supposed to be. It's just a short jumper with a chassis mountable jack. I was just interested in the jack, so I cut the cable to the short length I needed to get into the enclosure and make the connection on the board. The one last connection that needed to be made was for the PTT circuit. For this connection I used an old female serial cable I had laying around. I just cut one side of it off and soldered the connections to the board. In case you don't have one laying around, you can also find it at aliexpress for about $.60 here. After all that, the interface was done. Now to make cables for my various radios. I have three radios I use regularly. A Yeasu FT-840 HF rig, a Kenwood TM-281a 2 meter mobile, and a Baofeng UV-5re Plus handheld. Each of them have a different type of plug and pinout. The TM-281a has an RJ-45 mic jack on the front where you connect the audio in and the PTT control to. In order to get audio out of the radio, you need to use the external speaker connection on the back of the rig. While thinking about the pinout on the Easy Digi RJ-45 connection, I decided to align the pin-out with this 2 meter rig, since it's the one I primarily use. You can connect straight through with the exception of the two wires that need to connect to the speaker out. The FT-840 has an 8-pin barrel connector for the audio in and PTT control. Actually, if you look at it, there is a PTT control on the back. But to make connecting it simpler, I chose to use the mic connection. There is also both a external speaker and AF out connection on the back. Of the two, the AF out is the better option for connecting the interface. If you don't have an RCA plug handy, you can get by with using the speaker connection. Instead of making a whole new cable, I made a short adapter that converts the 8-pin barrel to an RJ-45 plug. This will allow the use of the TM-281a cable to connect to this rig also. The Baofeng UV-5re shares the same pin-out among many models including some Kenwood handhelds. So, this cable will probably help a lot of people. I used an RJ-45 plug to connect into the interface and two 3.5 mm TRS audio plugs to make the connection on the radio. Note, on the handheld the speaker out connection is a 2.5 mm jack. You will need an adapter to convert it, unless you buy some 2.5 mm plugs to construct your cable. The trick is the PTT control. 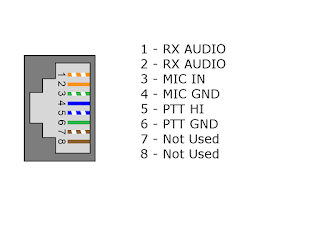 PTT is activated by shorting the shield of both the speaker and mic connection on the radio. In order to make this happen, you will need to splice the PTT ground and PTT HI wires onto the shield of the mic and speaker plugs. Some other things you may need to consider while setting up. Modern computer no longer have old fashioned serial ports anymore. So, you may need a USB to Serial adapter to make the PTT work. Also, I've noticed that PC's are starting to omit the separate mic and speaker jacks and instead use a TRRS type headset jack. This again will require an adapter if you don't make a special cable to wire into your kit. 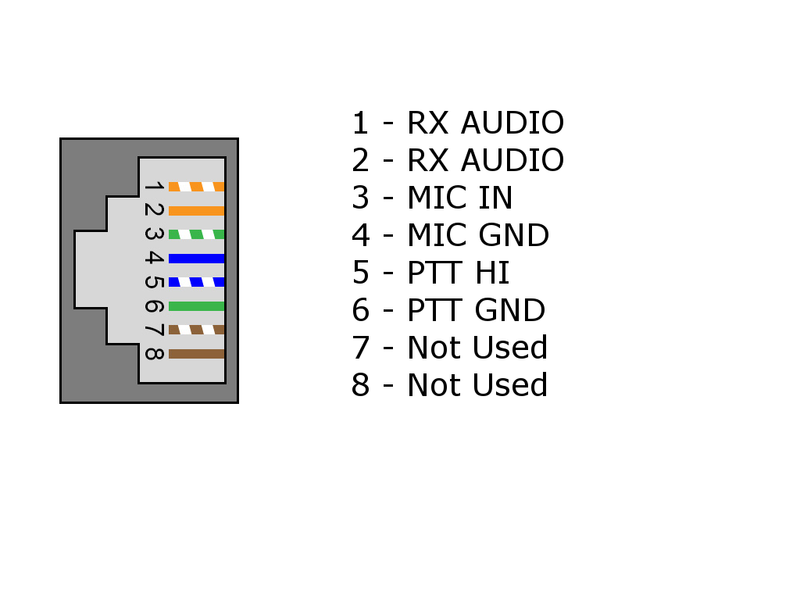 Note, the pin-out of TRRS jacks and plugs can vary. So, be sure to figure out the actual pin-out of your equipment to save frustration. I used a lot of parts from the Aliexpress website. They are in China. So parts are cheap and shipping is free, but be prepared to wait at least four weeks for everything to show up at your door. If you are in a hurry, Amazon might be a better option for finding these components. Per request from another HAM here is the shopping list and a list of prices for both Amazon and Aliexpress. Note that there is a huge difference in the total price. Here's an Amazon link to one like I used in this article.